I always forget the exact syntax for making a symbolic link from the command line. It’s quick enough to look it up, especially when using Fish’s history search capabilities, but ever since I noticed you could make symlinks with LaunchBar, that has become my preferred method. The animated GIF below shows making a symlink of a folder in my LaunchBar actions folder (~/Library/Application Support/LaunchBar/Actions/beats-x-launchbar-actions) in a subfolder in my Projects folder (~/projects/launchbar-actions). Select the folder you want the symlink to point to. In this case I selected it in the Finder and sent it to LaunchBar with Instant Send. Select “Make Symbolic Link (Absolute)” from the list of file actions. This is a real case I ran into the other day while posting to my blog. The image embed code generated by WordPress set the image dimensions to twice what I wanted them to be. My intellectual laziness (not wanting to do some simple math in my head) is your gain because you’re going to learn how to do some quick calculations “in-place” with LaunchBar’s calculator and Instant Send feature. Select the number you want to do a calculation on. Send that number to LaunchBar with Instant Send. In my case that’s done by double-tapping the Command (⌘) key. Type /2 to divide the number by two. Type ShiftEnter to paste the resulting number back into the app you initially copied from. Type the math equation in place. In this case by turning 628 into 628/2. Select that equation and send it to LaunchBar with Instant Send (double-tap Command). LaunchBar automatically detects you gave it a math problem so it instantly solves it for you. So type ShiftEnter to paste the result back to where it came from. How many times have you typed something like atom .gitignore or code my-project to open a specific file or folder in your editor? And how many times have you typed code . to open the current folder in your editor? I personally do that one a ton. Not only is that too many characters to type, what happens when you decide that Atom is slow and it’s time to move to Visual Studio Code? You’ve got to retrain yourself to use a different four character command each time you open a file or directory. Fish: alias ee "e ."
Every time I type ee to open the current directory, I smile. At least on the inside. And you will, too. 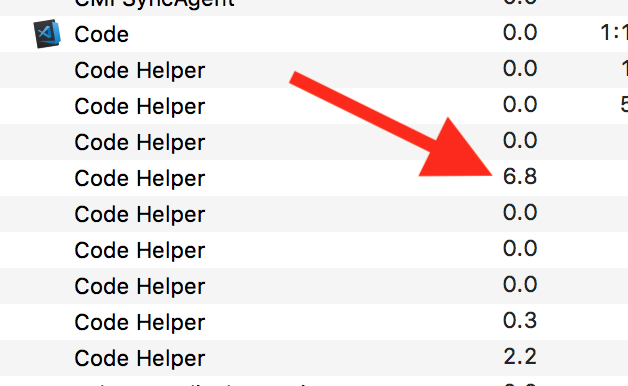 Thanks to iStats Menus I noticed there was a process constantly using just enough CPU to attract attention. Activity Monitor showed that one of the VS Code helpers was hovering at around 7%. Not terrible, but it was annoying me. After a little trial and error, disabling and reenabling extensions, I discovered it was the Settings Sync extension. Once that was disabled things calmed down. I dug a little deeper and discovered that it was turning on the sync.autoUpload setting (which is off by default) that was really doing it. With that set back to false the extension ran fine without using a bit too much CPU for my taste. Got a good solution to this scrolling problem? I’m not sure how I made it this far into my career without knowing I could quickly switch between fish and bash and zsh and any other shell I have on my system by simply typing the name of the shell I want to use. Trying to decide if you should replace spaces in your files names with dashes or underscores? Choose dashes. Why? If you use dashes, when you are editing the file name you can jump from word to word by tapping the left or right arrow key while holding down Option. Said another way, macOS recognizes the dash as a word separator; not so with the underscore. If you’ve got VS Code’s enablePreview options turned on, and they are by default, you might like to know that you can just hit ⌘-S to take it out of “Preview Mode” to prevent it from being replaced by the next file you open. In my opinion this is better than the other methods to make a file stay open: double-clicking the file’s tab (eww, touching your mouse or trackpad) or making the file “dirty” by entering some text and immediately deleting it. I’ve never used this “preview” feature in any editor. I’ve recently gotten sick of ending up with dozens of tabs open in a project so I’ve been giving it a shot. This little tip is making me actually enjoy the feature. Speaking of preview modes in text editors, I’d kill for Sublime Text’s legit preview mode the would instantly show you the contents of the file you had selected in the Quick Open menu. So good! I just installed node 8.9.1 with nodenv. Then I wanted to get my global packages installed to more-or-less match what I had with my previous version of node (v6.11.3). 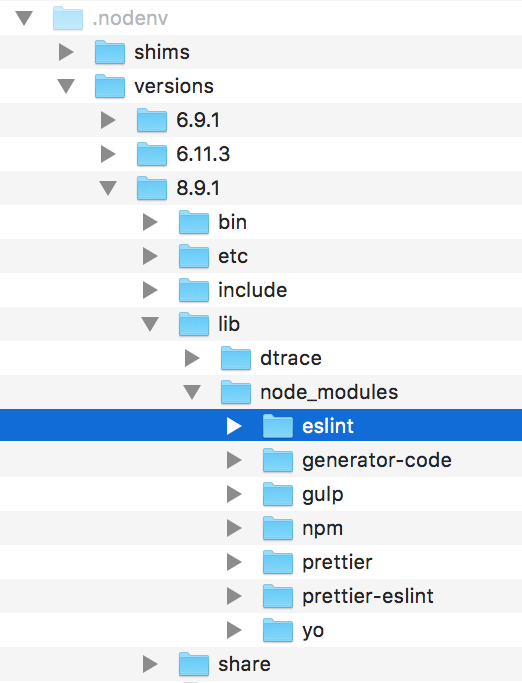 So with node 8.9.1 active I ran npm i -g eslint gulp prettier prettier-eslint yo generator-code to start installing a bunch of — but not all of — the global packages that I wanted. And further, digging into where nodenv actually stores the globally installed modules, in this case ~/.nodenv/versions/8.9.1/lib/node_modules, I see that eslint is indeed there at the top level! Why doesn’t npm list eslint as a top-level globally installed module when it seems as though it is one? The follow up question is: Why does it bother me as much as it does that eslint doesn’t show up in that list of global modules even though everything works as though it is a top-level global module? That’s extreme and is likely something that you wouldn’t want to do in most situations. At this point reinstalling prettier-eslint works and eslint still shows up as a global package. Being able to use three fingers to swipe between an app’s tabs, and then quickly close a tab with a swipe down, feels like an entirely new way to casually do light work.